Over the past month, Australia has seen plenty of new titles arrive to it’s Netflix screens. But with so many, it can often be hard to keep up. That’s why we take some time every week to give you a list of all the titles that have come and highlighted some that stand out to us. 9 Movies, 1 Documentary, and 7 TV shows have been welcomed and although this might not seem like too many, there are still some great movies and shows you can get stuck into. 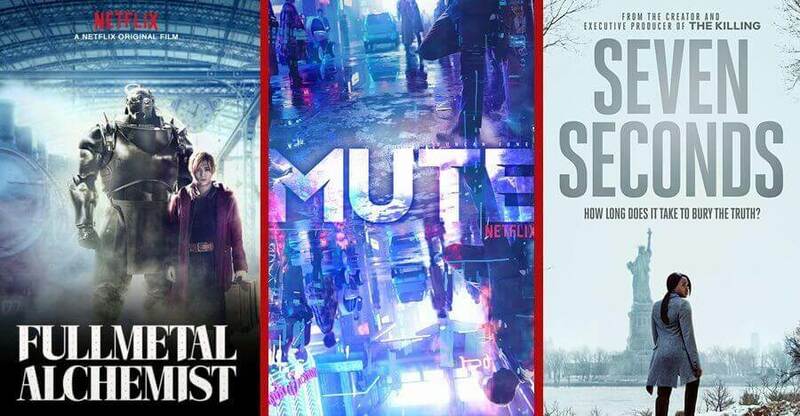 Our first pick for this week is the new Netflix original film ‘Mute‘ starring Alexander Skarsgård, Paul Rudd and Justin Theroux. This sci-fi thriller follows a mute bartender forty years in the future, whose girlfriend and the only thing keeping him going disappears suddenly. In a drastic search, the bartender gets led deep into the city’s underbelly and meets a pair of strange American surgeons. Although it has received mixed reviews, we think any sci-fi fan should still take some time to check this out. Another addition we thought was worth mentioning was the live-action adaptation of ‘Fullmetal Alchemist‘. Based on the popular anime and manga of the same name, this fantasy film is set in a world where Alchemy is widely practiced and used. Two brothers attempt the highly forbidden technique of human transfiguration and end up badly damaging their bodies, and in order to restore their lives must hunt for the legendary philosopher’s stone. Fans of the franchise should be pleased to see this film is now on Netflix. Our final pick is once again another Netflix Original, this time the new series ‘Seven Seconds‘. The series follows the loss of a family after the tragic death of one of their sons after being hit by a police car. Racial tension is running extremely high in Jersey City especially as a cover-up is obvious. The show is based on the Russian film The Major and has been met very well since it’s release. This is a crime drama that should definitely be on your watch list.